Reno, NV, March 19, 2019 --(PR.com)-- NominoData is unveiling its newly enhanced MRB Compliance due diligence solution powered by Senzing® software. Senzing is the first real-time AI for entity resolution. The enhanced offering is a complete package of screening and linking capabilities integrated with the powerful Nomino Data MRB Compliance marijuana related businesses database that is easily deployable in environments with simple interfaces to customer files. NominoData’s registered entities screening solutions benefit FI's by enabling investigators to obtain intelligence information pertaining to Sanctions, Negative News, PEPS, Corporate Beneficial Position & Registrations, Panama Papers /Wikileaks, Exchange Enforcement. Includes automated audit trail and case management. This tool is critical for ACAMS members. The release of this enhanced software due diligence solution can be viewed in detail by downloading the Registered Entities Screening Solutions brochure attached to this release. Representatives of NominoData will attend the ACAMS Money Laundering and International Financial Crimes Conference in Hollywood, Florida on April 15-17, 2019. If you would like to schedule a meeting at that ACAMS conference, please mail to: info@nominodata.com. “We are excited to partner with Nomino Data on this important MRB initiative, and ultimately help organizations better comply with regulatory issues and requirements.” – Jeff Jonas, Founder and CEO, Senzing. NominoData is a solutions company formed to help clients with worldwide identity, compliance, and risk management issues associated with modern day commerce. Our team leverages their expertise into innovative and productivity-boosting solutions that revolutionize their field. NominoData supplies both plug-n-play and integrated software solutions supporting the AML, money-laundering, HIDTA HIFCA and financial industries dealing in fraud and compliance. To learn more, call +1-775-335-2030 or visit www.nominodata.com. Senzing delivers the first real-time AI for entity resolution. With Privacy by Design principles built in from the start, the plug-and-play Senzing entity resolution products are the most affordable, easy-to-use solutions for discovering who is who and who is related to who in big data. Financial Services, Healthcare, Government, Manufacturing and other organizations use Senzing to improve fraud and risk detection, marketing and customer 360 programs - and AML, GDPR and other regulatory compliance efforts. Global companies, government organizations, small and medium-sized businesses and independent software vendors are deploying Senzing® technology to better understand their data and augment analytics initiatives. To learn more, visit www.senzing.com. 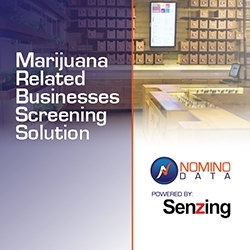 Offering a complete package of screening and linking capabilities integrated with the powerful Nomino Data MRB Compliance marijuana related businesses database that is easily deployable in your environment with simple interfaces to your customer file.